Tucker crashed halfway through moto one, then pulled out of the race. He said he cartwheeled and smashed his face in the ground. He’s fine and so far his bike seems to be okay too. He came back to the trailer to regroup and get ready to “kill it” in moto two! In moto two, Tucker had around a 30th place start. He rode well and pushed hard the entire moto to finish in 18th. His results certainly didn’t reflect how well he was riding! It’s 55 and raining in Southwick, Mass. It feels more like a snocross race than a motocross race! Tucker finished 24th in the timed practice. He said he felt really good and is confident he can put together two solid motos this afternoon. There are a lot of snocross fans here so hopefully he can put on a good show for them! You can watch the first moto live on www.allisports.com at 1 p.m. EST. The second moto will be on SPEED tonight along with the second moto from Budds Creek. Tucker along with Tim Ferry will be at the Southwick Inn in Southwick, Mass. tonight from 6-8 signing autographs. If you’re in the area, make sure to stop by! August 5 – Hey Everyone, it’s Mandi. I wanted to give you an update on Tucker’s mountain bike racing. 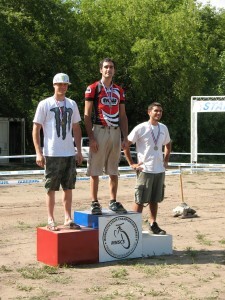 On Sunday, July 26 Tucker and I raced our first Minnesota State Championship Series (MNSCS) mountain bike race. It was actually my first-ever MTB race! 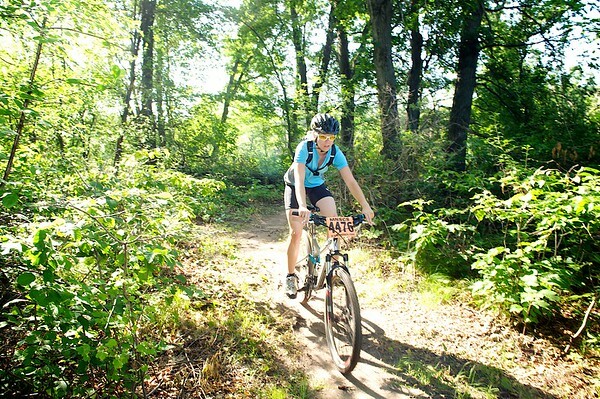 The race was at Elk River on a trail we rode the week prior with one of our friends. It’s a great single track trail that Tucker felt really fit his riding style. I raced in the women’s division in the Citizen class and Tucker raced the Comp class. There is also an expert class but Tucker didn’t feel ready to jump into the expert class his first race. My race was at 9:30 am and to say that I was nervous is an understatement! Tucker reassured me that I would be fine and if I was too tired I could pull off after the first lap. My class did two laps of sections one and two of the trail. By the end of the first lap and after crashing once, I was toast! I didn’t know it was possible to be so out of breath but there was absolutly no way I was going to quit…so I kept on pedaling and slowly started to feel better. I was actually surpirsed to see the finish line and was a little dissapointed because I was finally feeling good again. At 1 pm, Tucker lined up for his race. He didn’t really set a goal set because he didn’t know what to expect. His race was much longer than mine. He had to ride sections one-four, twice. I was only able to see him on a few sections of the course which was a huge change for me. In snocross and motocross I can generally see him the entire race or have a radio with someone giving me updates when I can’t see him. This made me a little nervous because I know how he likes to ride – wide-open, the entire time! He managed to finish the race without crashing and to his surprise he finished ninth overall in the comp class and second in his age division! He got a cool medal and stood on a little podium with the other top finishers. I think he was prouder than when he’s on the top of a snocross podium at a national! I even got a medal and stood on the podium for finishing third in my age division. It was a great day and we already plan on racing the next MNSCS race on Sunday, August 9 at Buck Hill. 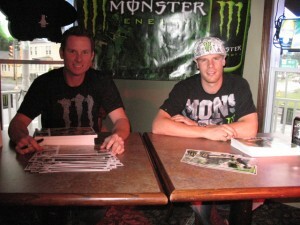 On last Wednesday, we both made the trek back down to Minneapolis to race the Thursday night Buck Hill race. Tucker had an awesome race and got to battle with his good friend John Sandberg. They were in a heated battle for 6th, when Tucker crashed pretty hard in a high-speed sand corner at the bottom of a big downhill. Luckily, he was uninjured and was still able to finish 9th. That’s his career best Buck Hill finish. Sled Head 24/7 was there filming for a feature on Tucker’s “off-season.” They got his crash on film so make sure to look for the show on Versus this Fall! August 6 – The final Thursday night Buck Hill race of the summer. 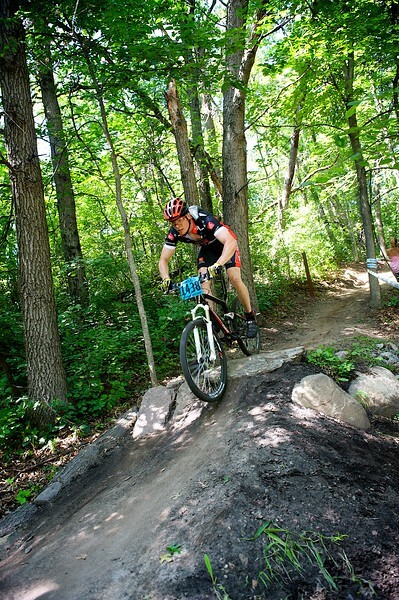 August 9 – MNSCS Race at Buck Hill. September 19- The Fat Tire Festival, Chequamegon 40. It’s a 40-mile race that he also did last year. Below are a couple photos by Dana Schoppe of Tucker and I at the MNSCS Single Track Attack in Elk River, Minn.
Tucker on the podium at the MNSCS Single Track Attack. Sunday, July 26. Tucker, John and Kale decided to go for a little cruise in rural Goodridge last week in the water truck. Below is a newsletter from FCA about the camp Tucker did on July 19. More photos will be posted soon! On Sunday July 19, 57 riders converged on what is becoming one of the best known MX tracks in the Twin Cites, ERXMotorPark, for the first ever MN FCA Trackside Training. These young riders had the chance to watch these top level professional riders compete on Saturday in Millville, MN at the AMA Spring Creek National. It was an unbelievable opportunity to be trained by some of the best riders in the nation, right here in Minnesota. Over lunch, the riders heard what it was like to be a pro from Andrew Short, Gavin Graycik, Tucker Hibbert, Jimmy Povolny, and Jesse Strege. Each one of our pro instructors shared about their relationship with Jesus Christ and what their personal faith meant to them. Jake Vanada, FCA West Metro Staff, presented the gospel “MX Style”. God showed up. Big time. Over 30 riders and family members prayed to repent and ask Jesus into their lives. It was…well…totally AWESOME!! Praise God. World Class Track. Premium Professional Instruction. Lots of bikes/engines/noise! And the Word of God. It was an awesome day for sure. We are proud to bring 1 of 5 national camps to our state this summer. 3 of the 5 camps have sold out. Help get the word out to people you know who ride. This is an unbelievable opportunity to share the message of the gospel of salvation…the hope of LIFE in Jesus name with MotoCross Athletes. When we see God at work…it is an awesome thing. Thank you for your support, prayer, resources and encouragement. It is what allows me to do what God has called me to do…reach this generation with the power and love of Jesus Christ! May God be praised and may He get the glory.